Thanks for the comment! I appreciate it. Really nice ! I like it ! Yep, I have him credited in the comments! Thanks! I love the pastel colors they look amazing and really bring out the feeling of the picture. Nice coloring! Very well done! I like the tones pretty much. Hey, thanks so much! I appreciate the kind comment! No problem, you deserve it! Cool! I like the colouring. If this is your first try at this style then all I have to say is "Keep going it looks great". Yeah, I've never used this kind of technique before, and I'll definitely be using it more in the future! Thanks for the comment! Cool! This is pretty good! Thanks for the colors! 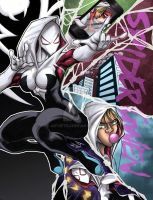 If this isn't already a cover for Spider Gwen's comic series, it needs to be. Seriously epic job, all of you. I really appreciate the kind comment! Thank you! While I've not seen the original to compare it to, this is a nice coloring job. You do a really good job of enhancing the visuals of the line art. Bravo! Awesome of you to say, thanks! I like the idea of a female spiderman,also well done work on poses and coloring. I didn't do the artwork, just the colors, but thanks so much!